At luncheon today (soup, bread, and sausages), I noticed a lot of birdy activity in my garden. 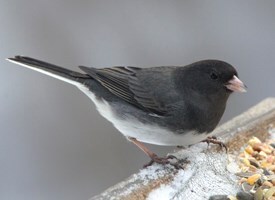 A whirlwind of Sparrows and Dark Eyed Juncos descended upon my feeders and as I gazed curiously out the dining room window, I saw the reason. Yesterday’s wind and rain had tumbled a feeder out of its tree and had strewn its contents in a wide swath and triggered the current “fly-in”. Even my Blue Jay and Woodpecker visited as well as many households of squirrels. The Woodpecker spent a little more time than usual in the lilac bush pecking at the branches. An hour or two later, I heard a terrific rat a tat tat sound coming from quite close- I thought to myself, that Woodpecker sounds like he’s pecking on my house. I was a little excited, I must admit. But the excitement did not last long, alas, a neighbor was merely repairing a fence.